The Defense Ministry announced Monday it will terminate talks with its South Korean counterpart over the radar lock-on dispute, while revealing what it claims are sounds, converted from radio waves, of the fire-control radar system of a South Korean destroyer. The 18-second audio file, if genuine, reportedly shows that continuous, intense radar waves were directed at the P-1 anti-submarine patrol airplane operated by the Maritime Self-Defense Force on Dec. 20 in the Sea of Japan. Japanese defense officials said the wave patterns are completely different from surface search radar waves that Seoul claimed were being used by the South Korean Navy’s Gwanggaeto destroyer. “We believe a third party would be convinced that what we have said is true if they examine the sounds, a video footage and other materials in a comprehensive way,” said a senior Defense Ministry official who briefed reporters at the ministry, referring in particular to 13 minutes of video footage. The video footage also included the voice of the pilot of the MSDF P-1 aircraft, who the ministry said heard the same radar sounds while flying near the destroyer. 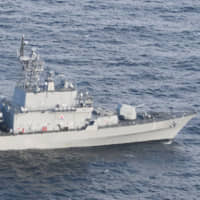 Japanese officials said that they had identified FC (fire control) waves as being directed from the STIR-180 fire control system of the South Korean destroyer. However, it is not yet clear — and is perhaps unlikely — that the newly-revealed evidence will put an end to the Tokyo-Seoul dispute. “We express deep regrets over its decision to stop consultations designed to verify the facts,” Choi Hyun-soo, a spokeswoman for Seoul’s defense ministry, said of Tokyo’s move, according to Yonhap News Agency. “The sounds that the Japanese side presented are just mechanical sounds from which we can never verify the pieces of information we have demanded — the detection date, angle and traits of electromagnetic waves,” she added. Japanese officials said they processed the sound waves to protect sensitive military technical details relating to the STIR-180 radar system used by the South Korean destroyer, because it is used also by other countries including Thailand, Canada and Taiwan. Tokyo also needs to limit wider knowledge of the abilities of its own equipment that received and analyzed the waveforms, as well, they said. Thus the sounds alone are not a smoking gun that proves the alleged radar direction by the South Korean destroyer. But together with the video footage and other materials Tokyo has revealed, the sound patterns would serve as evidence powerful enough to convince third-party countries that Japan’s claim is correct, the senior Defense Ministry official argued. Shortly after 5 p.m., the Defense Ministry uploaded the audio file and briefing materials in English and Korean onto its website. Tokyo had proposed that Japan and South Korea simultaneously present the radar data records to each other in a closed meeting, to determine whether what Japan detected were radio waves from the FC radar system in question. But Seoul has rejected this proposal, according to Japanese officials. South Korea has meanwhile claimed the P-1 aircraft was flying near the destroyer, saying it conducted “a threateningly low-altitude flight” against the South Korean vessel. On Monday Japan’s Defense Ministry also revealed the detailed altitudes and flying courses of the P-1 aircraft at that time, saying the MSDF P-1 maintained a sufficiently safe altitude of about 150 meters and a distance of 500 meters from the destroyer even at its closest. The P-1 did not conduct a flight that may interrupt the destroyer’s activities, either, the ministry also said. Even prior to this incident, the MSDF had conducted similar flights and photographed the same South Korean destroyer in question three times. But South Korean authorities did not express concerns over any of those flights, the ministry said. The MSDF took those photographs on April 27, April, 28, and Aug. 23 last year, at the altitude of 150 meters each time, according to the defense ministry. It did not reveal their locations. The response of South Korean officials were not immediately available. Japan’s Defense Ministry “had requested additional objective evidence to support ROK’s claim at the working-level meetings, but the ROK has failed to provide such evidence, and has repeatedly responded with claims that entirely lack objectivity,” the ministry said in the statement. ROK is the acronym of the formal name of South Korea, or Republic of Korea. “That being said, our stance remains unchanged in that Japan-ROK and Japan-ROK-U.S. defense cooperation is extremely important, and is indispensable in confronting security challenges such as the nuclear and missile issue in North Korea and maintaining the stability of the security environment in East Asia. We hope that this announcement will lead to the prevention of similar incidents in the future,” the ministry said.